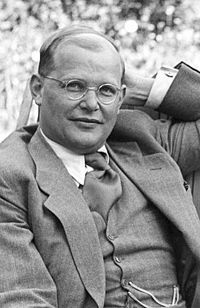 Dietrich Bonhoeffer (February 4, 1906 – April 9, 1945) was a German Lutheran pastor, theologian, a participant in the German resistance movement against Nazism and a founding member of the Confessing Church. He was involved in plans by members of the Abwehr (the German Military Intelligence Office) to assassinate Adolf Hitler. He was arrested in April 1943 by the Gestapo and executed by hanging in April 1945, 23 days before the Nazis’ surrender. His view of Christianity’s role in the secular world has become very influential. Bonhoeffer wrote the prayer below while incarcerated in a Nazi prison, uncertain of what his future would hold. It’s a new day and most of us are likely enjoying freedom outside the walls of a prison. We may be facing a variety of events and issues; some big and some small; some tough and some easy. But few of us are facing execution. In the midst of his darkness, Bonhoeffer asked God for the liberty and strength to live in such a way that he could one day stand before God unashamed. When we pray today, what will we ask of God? You’re welcome Chris! Hope you experience His closeness in a fresh way today! I appreciate the reminder that drawing close to Him is what matters most! Thanks! This prayer shows his faith and how faithful God is. And puts my life into perspective. Thank you for sharing. I needed it this week. You’re welcome! I too was humbled when I came across it. Glad it ministered to you. Awesome words by an awesome servant of God. This man’s life leaves me humbled. ‘The cost of discipleship’ is truly great… for all who are in Christ Jesus. But some are called to endure much more than many of us can imagine. Thanks for sharing this, friend. God bless. You’re welcome and thanks for sharing the journey. Few challenge as much with the way they lived their life than Bonhoeffer! Blessings!